Ectoparasites—in addition to being a nuisance—are associated with allergies, skin infections, and self-induced traumatic injury in pets. They are also vectors of infectious and zoonotic disease-causing agents, some of which can prove fatal.1-6 Fleas, ticks, mites, and lice are common ectoparasites seen on cats in the United States. Choosing products that address difficult-to-treat life stages: Larvae and eggs may be located in hard-to-reach areas (eg, deep within the carpet) and pupae can withstand many chemical treatments. many drugs are formulated to treat ectoparasites, but some that are safe for use in or on dogs are not safe for use in cats due to potential adverse effects, including death. Follow label instructions carefully. Address sources of continued environmental contamination. A blood-engorged female deposits a single clutch of thousands of eggs into the environment; from those eggs hatch 6-legged larvae that find the first host. Larvae attach and feed for a few days before falling off and molting in the environment into 8-legged nymphs. Nymphs find another host, feed for days to a week, detach, and fall into the environment, molting to the final stage—8-legged adult male and female ticks. The female can lay several clutches of eggs in the environment. When the larvae hatch, they obtain a host, crawling into the ear canal, feeding, and molting into the first and second nymphal stages. Second-stage nymphs crawl out of the ear canal and enter the environment, molting into the nonparasitic adult stage; the adults mate off-host. Applying acaricides to yard and perimeter. FIGURE 3. 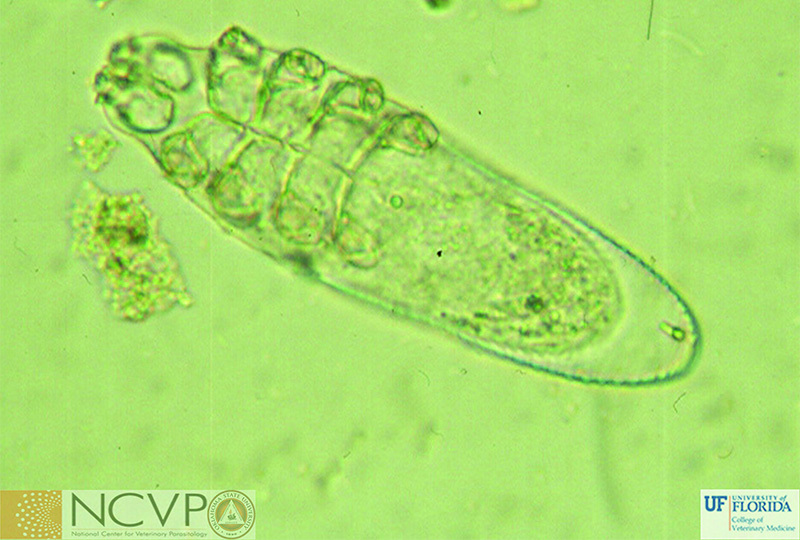 Microscopic views of Otodectes cynotis, 200× magnification (A) and Demodex gatoi, approximately 400× magnification (B). The generic mite life cycle involves eggs, larvae, 2 nymphal stages, and adults, and takes 3 to 4 weeks to complete. 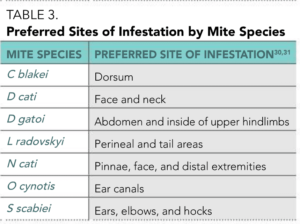 All stages of mites can live in tunnels burrowed through the skin, within hair follicles, or on the surface of the host’s skin, but preferred sites of infestation depend on the species (Table 3).3,30,31 Mites are transmitted between hosts by direct contact with an infested animal. Treatment of mite infestations is more straightforward than treatment of fleas or ticks. Addition of antibiotics may be necessary if a secondary bacterial infection is present. The female lays many eggs throughout her life and cements them to the hair of the host. A nymph hatches from the egg in 1 to 2 weeks; nymphs feed on tissue debris and undergo 2 additional molts to become adults. Adults also feed on tissue debris and mate while in the haircoat of the cat. Implement strategies to prevent future infestations. Many safe and effective products are available for routine use in cats. Some products not only control the ectoparasites discussed in this article but also prevent or treat other parasitic infections.15 CAPC recommends broad-spectrum parasite control for every pet year-round; visit capcvet.org/resource-library for a comprehensive summary table of available ectoparasite control products for use in cats. Dyden MW, Rust MK. 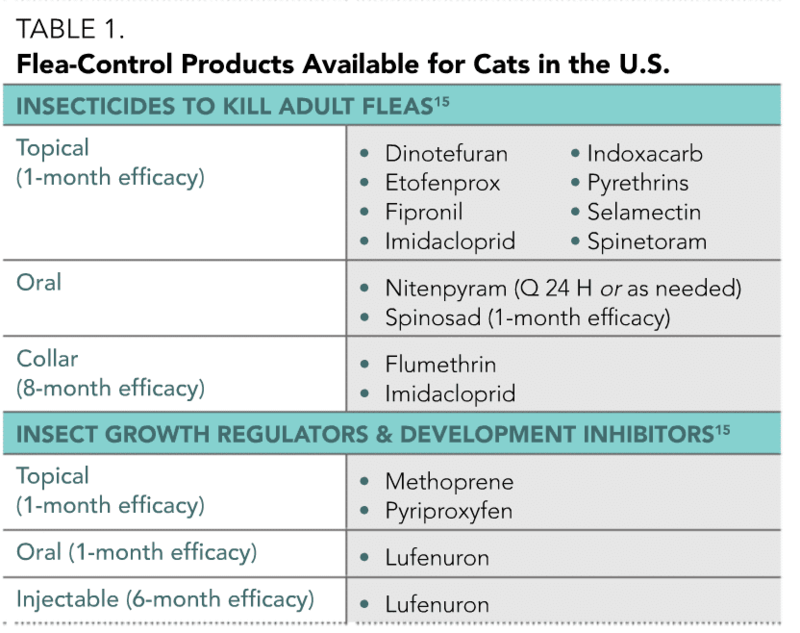 The cat flea: Biology, ecology, and control. Vet Parasitol 1994; 52(1-2):1-19. Moriello KA. Zoonotic skin diseases of dogs and cats. Anim Health Res Rev 2003; 4(2):157-168. Arther RG. 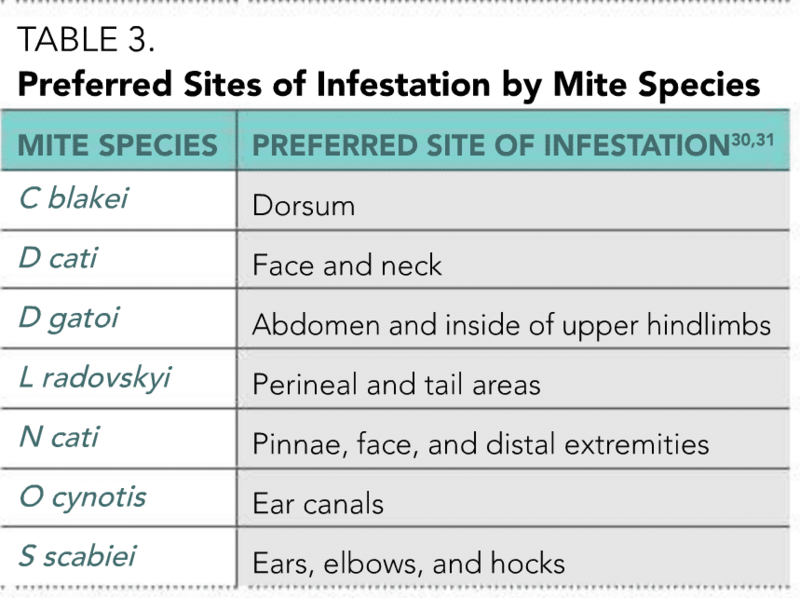 Mites and lice: Biology and control. Vet Clin North Am Small Anim Pract 2009; 39(6):1159-1171. Blagburn BL, Dryden MW. Biology, treatment, and control of flea and tick infestations. Vet Clin North Am Small Anim Pract 009; 39(6):1173-1200. McElroy KM, Blagburn BL, Breitschwerdt EB, et al. Flea-associated zoonotic diseases of cats in the USA: Bartonellosis, flea-borne rickettsioses, and plague. Trends Parasitol 2010; 26(4):197-204. Eisen RJ, Gage KL. Transmission of flea-borne zoonotic agents. Annu Rev Entomol 2012; 57:61-82. Coles TB, Dryden MW. Insecticide/acaricide resistance in fleas and ticks infesting dogs and cats. Parasit Vectors 2014; 7:8. Harman DW, Halliwell RE, Greiner EC. Flea species from dogs and cats in north-central Florida. Vet Parasitol 1987; 23(1-2):135-140. Rust MK. Influence of photoperiod on egg production of cat fleas (Siphonaptera: Pulicidae) infesting cats. J Med Entomol 1992; 29:242-245. Silverman J, Rust MK. Extended longevity of pre-emerged adult cat flea (Siphonaptera: Pulicidae) and factors stimulating emergence from the pupal cocoon. Ann Entomol Soc Am 1985; 78:763-768. Olsen A. Annual Report. Lyngby, Denmark: Danish Infestation Laboratory, 1990, pp 59-60. Halos L, Beugnet F, Cardoso L, et al. Flea control failure? Myths and realities. Trends Parasitol 2014; 30(5):228-233. 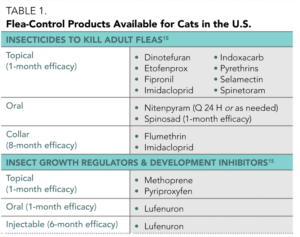 Siak M, Burrows M. Flea control in cats: New concepts and the current armoury. J Feline Med Surg 2013; 15(1):31-40. Dryden MW, Payne P, Zurek L. Fleas infesting our pets and homes. Kansas State University Agricultural Experiment Station and Cooperative Extension Service; September 2003. Inglis S (ed). Compendium of Veterinary Products. Shawnee, KS: Bayer Corporation, 2014. Dryden MW, Payne PA. Preventing parasites in cats. Vet Ther 2005; 6(3):260-267. Akucewich LH, Philman K, Clark A, et al. Prevalence of ectoparasites in a population of feral cats from north central Florida during the summer. Vet Parasitol 2002; 109(1-2):129-139. Dryden MW, Payne PA. Biology and control of ticks infesting dogs and cats in North America. Vet Ther 2004; 5(2):139-154. Stafford KC III. Tick Management Handbook. South Windsor, CT: The Connecticut Agricultural Experiment Station, 2007; available at ct.gov/caes/lib/caes/documents/publications/bulletins/b1010.pdf. Centers for Disease Control and Prevention. 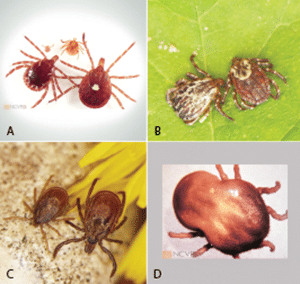 Ticks: Geographic distribution. Available at cdc.gov/ticks/geographic_distribution.html. Berrada ZL, Telford SR III. Burden of tick-borne infections on American companion animals. Top Companion Anim Med 2009; 24(4):175-181. Childs JE, Paddock CD. The ascendancy of Amblyomma americanum as a vector of pathogens affecting humans in the United States. Annu Rev Entomol 2003; 48:307-337. American Association of Veterinary Parasitologists. Otobius megnini. Available at aavp.org/wiki/arthropods/arachnids/metastigmata/argasidae/Otobius-megnini/. Breitschwerdt EB, Abrams-Ogg A, Lappin MR, et al. Molecular evidence supporting Ehrlichia canis-like infection in cats. J Vet Intern Med 2002; 16:642-649. Magnarelli LA, Bushmich SL, Ijdo JW, et al. Seroprevalence of antibodies against Borrelia burgdorferi and Anaplasma phagocytophilum in cats. Am J Vet Res 2005; 66:1895-1899. Blouin EF, Kocan AA, Glenn BL, et al. Transmission of Cytauxzoon felis (Kier, 1979) from bobcats, Felis rufus (Schreber), to domestic cats by Dermacentor variabilis (Say). J Wildl Dis 1984; 20(3):241-242. Petersen JM, Mead PS, Schriefer ME. 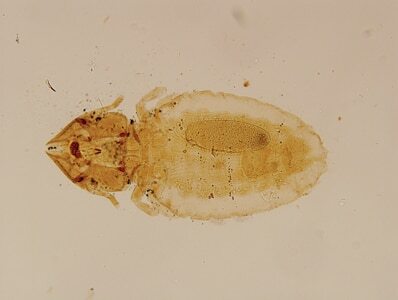 Franscisella tularensis: An arthropod-borne pathogen. Vet Res 2009; 40(2):7. Reichard MV, Meinkoth JH, Edwards AC, et al. Transmission of Cytauxzoon felis to a domestic cat by Amblyomma americanum. Vet Parasitol 2009; 161(1-2):110-115. Craig TM, Teel PD, Dubuisson LM, Dubuisson RK. Lynxacarus radovskyi infestation in a cat. JAVMA 1993; 202(4):613-614. Curtis CF. 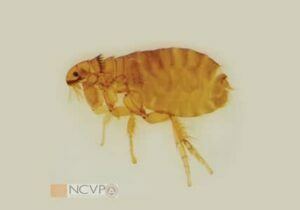 Current trends in the treatment of Sarcoptes, Cheyletiella, and Otodectes mite infestation in dogs and cats. Vet Dermatol 2004; 15(2):108-114. Beale K. Feline demodicosis: A consideration in the itchy or overgrooming cat. J Feline Med Surg 2012; 14(3):209-213. Shanks DJ, Gautier P, McTier TL, et al. Efficacy of selamectin against biting lice on dogs and cats. Vet Rec 2003; 152(8):234-237. Pollmeier M, Pengo G, Longo M, Jeannin P. Effective treatment and control of biting lice, Felicola subrostratus (Nitzsch in Burmeister, 1838), on cats using fipronil formulations. Vet Parasitol 2004; 121(1-2):157-165. Lindsay Starkey, DVM, is the Bayer Resident in Veterinary Parasitology at the National Center for Veterinary Parasitology, Oklahoma State University (ncvetp.org). Dr. Starkey received her DVM from Oklahoma State University. Jay Stewart, DVM, owns and operates Aumsville Animal Clinic in Aumsville, Oregon, where he enjoys both clinical and management responsibilities in his multi-doctor small animal practice. Dr. Stewart received his DVM from Colorado State University.